A Harmony Ball is essentially a chime pendant worn as a necklace, a lovely piece of jewelry originating from Bali in Indonesia. As the name implies a Harmony Ball can bring a sense of calm and harmony to the wearer as the pendant emits a soft but just audible chime sound with movement, creating a relaxing effect in a similar way that the sound of a rippling brook or small waves gently lapping the shore is relaxing. A harmony Ball is also known in Mexico as a Bola (Spanish for Ball) or Harmony Necklace or Pregnancy Necklace. Aside from bringing a sense of calm and harmony to the wearer, the Harmony Ball (Bola) has been worn for centuries by pregnant women in Balinese and Mayan cultures for the calming effect it can have on the unborn baby in the womb. Unfortunately this is where western society’s interpretation of the benefits of a harmony ball stops, the ‘during pregnancy’ phase. This doesn’t make a lot of sense really – does the unborn baby in the warmth and comfort of the womb need calming? I think not, there is no reason for the baby to be stressed inside the womb. Stresses in life begin after we are born, right. So if this is the case then what is the real benefit of wearing a harmony ball during pregnancy? Why have women in Balinese and Mayan cultures been wearing these chime pendants for centuries? 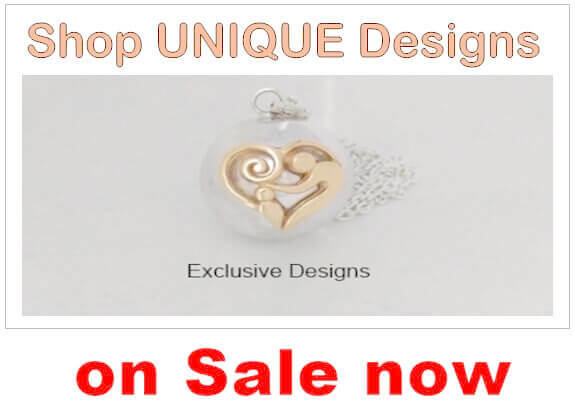 The pregnant woman will wear the pregnancy harmony ball on a long chain or cord so that the harmony ball pendant rests somewhere on her ‘bump’. As the mother-to-be goes about her daily tasks the pendant will move emitting the soft chime sound which is only just audible. This sound will penetrate into the womb and will be even softer. An unborn baby will begin to hear at about 20 weeks gestation so your unborn baby will begin to hear your soothing voice and your loving words, and the baby will also hear the soft chime sound of the harmony ball. Of course the unborn baby will hear other sounds too however particularly in the quiet surroundings of the home away from loud noises the baby will hear the soothing chime sound every time mum moves, whilst doing her housework, or simply getting up off the sofa to make a cup of coffee and even at the supermarket or walking down a quiet street - anytime she moves. Aside from mums own voice the sound of the harmony ball will be the most frequently common sound a baby in the womb will hear (sorry Dads). The real benefit of the Harmony Ball worn during pregnancy comes after the baby is born! "The real benefit comes during breastfeeding". 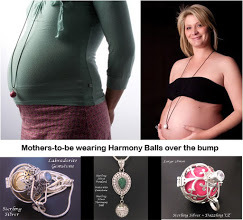 Soon after birth mum will shorten up her long harmony ball pregnancy necklace so that it is now around her breastbone area so whilst breastfeeding and gently rocking her newborn the chime sound from her harmony ball will be heard by the baby. It is a familiar sound to your baby, a sound associated with warmth and comfort. In addition to mums soft soothing words as her baby feeds the newborn hears the familiar chime. We are all much more comfortable and relaxed when we are in a familiar environment with familiar sights, sounds and smells – so too is baby. As the newborn grows he or she will extend their little hand to touch that shiny thing around mums neck and play with it and enjoy that familiar sound. Because baby is calmer then so is mum – many of the stresses often associated with breastfeeding for some mothers, are now taken care of – not necessarily on every occasion but often enough for there to be a tangible benefit. And as time passes and mum stops wearing her harmony ball there are times she may bring it out of its place of safe keeping and give it a shake or two to entertain or calm a young toddler. In Balinese culture a harmony ball becomes a keepsake, passed on from Mother to Daughter. 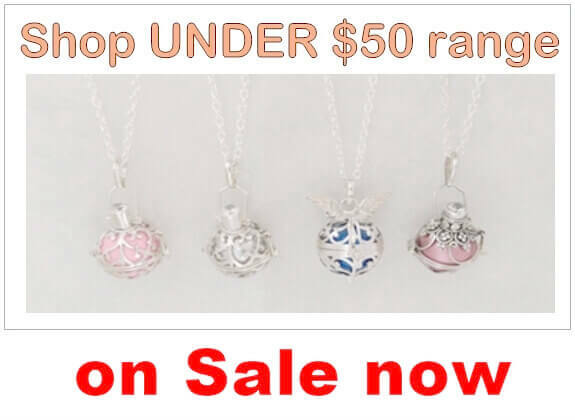 Harmony Balls come in a wide variety of designs with many having gemstones and are made from Sterling Silver making then a lovely piece of jewelry suitable as a keepsake - this is an excellent example of an Artisan crafted Sterling Silver Harmony Necklace that would make a terrific keepsake. 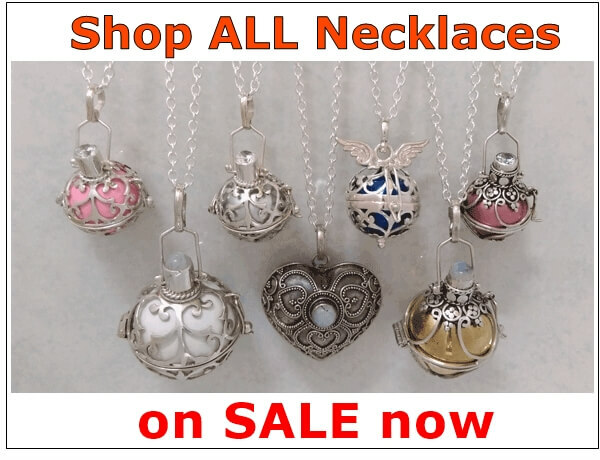 In fact many women wear harmony ball necklaces simply for the reason that they are a beautiful and often stunning piece of jewelry - you do not have to be pregnant to enjoy wearing a gorgeous Harmony Ball Necklace. Harmony Balls with Birthstone Gemstones add another dimension – not only are they a fabulous jewelry item but also mothers-to-be can choose to wear a harmony ball with their Birthstone gemstone, or as many do they select a Harmony Ball with the Birthstone which is for the expected birth month of their baby, adding even more significance to the jewelry item becoming a keepsake and being passed on to the child. Even if the baby is a boy it can be a keepsake from his birth that he could eventually pass on to his daughter – or even mum to her daughter-in-law. The custom of wearing a harmony ball has been carried out for a long time in Balinese and Mayan cultures so the benefits to mum and baby are likely to be realized in western society also. 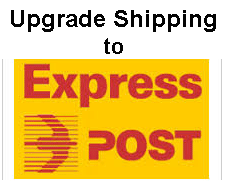 My personal experience is that the pregnancy harmony ball works, at least to a degree and any help is good help. Mothers of newborn (and older) babies have searched for centuries for ways to keep a baby calm, quiet, entertained – we use pacifiers, rattles, music, singing, rocking, toys and mobiles dangling over the cot(crib, bassinet) and many other things – put many of these together and you have …. a Harmony Ball.